Second in a series on games I loved, but no longer play. You can find Part One: Rolemaster here and Part Three: GURPS here. By 1981 I’d been playing for a few years. Most of that involved TSR products- D&D, AD&D, Top Secret, Boot Hill, Gamma World- they had a lock on things. They had a few multi-line competitors in Chaosium (weird fantasy and Call of Cthulhu), GDW (Traveller if you liked hard sci-fi), and FGU (complex and hard to get games like Space Opera & Aftermath or oddballs like Bunnies and Burrows). Other companies had one-shot games like the first superhero games. That genre kicked off with Superhero 2044, a terrible set of rules that grabbed everyone’s attention. By the time I started “playing” it, the older generation of gamers had already moved on to Villains & Vigilantes first edition. They played V&V the first time I got to sit in on a session of my older sister’s group. She ended up stuck with me at the game shop for some reason. The group was code-named "Duel" and I rolled up a character, Darkcat, with Claws, Darkness Control, and Revivification. I loved superhero stuff and once I tried V&V I switched to that. But then my sister came back from a local convention carrying a new game she’d seen demo’d: Champions. It didn’t look like any other game out there, it didn’t read like any other game out there, and you didn’t make characters like any other game out there. You built characters. Quickly- and I mean super-quickly- Champions invaded and split the gamers in my neck of the woods. If you’d been playing supers for some time and you liked story, then you probably focused on V&V. But if you liked crunch, simulationism, detailed combat, game balance, and being able to make exactly what you wanted- they you went with Champions. Over time, the latter won out- with V&V remaining on the fringes as a soft option until Marvel Supers and DC Heroes popped up later. It took me a long time to “get” Champions even though I read and played it repeatedly. I wanted to learn the system because I loved supers. That runs a close second behind fantasy as my favorite genre- and I’m good at running it. That may sound aggrandizing, but I know my strengths . Equally I know my weaknesses- sci-fi, 1920’s Call of Cthulhu, Pulp, or any kind of military game. 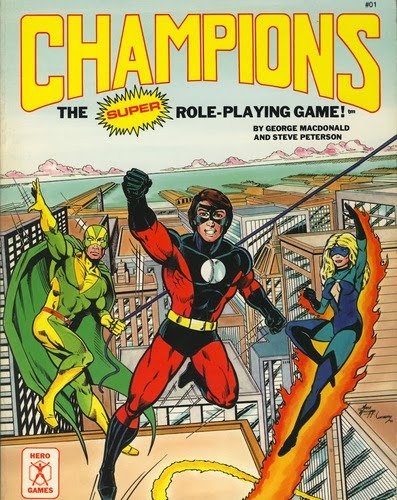 Champions became dominant superhero game among the older gamers I looked up to and hung out with. They often ran “Open Combats” when GMs didn’t have a game ready. The apparent balance of the system allowed for arena-style fights without a referee. I tried to get a handle on the mechanics- making up characters and running games for my peers. Mostly I fell back to using the various Enemies sourcebooks. College eventually pulled off most of those older gamers and the seed of my group formed. Around this time we began to see variations on Champions- Super Agents, Strike Force, Golden Age of Champions, Espionage and Danger International. This last game really demonstrated the power of the system and became the basis of a number of reskins and variations. One segment of gamers in our area started the Aegis campaign, which would eventually become one of the longest running in the country. I would play in it for a time years later. Our group split between Champions and DC Heroes. The former became the basis of many serious campaigns, including a Watchmen style game I ran on and off for years. The later became the fun pick-up game of choice. DC Crisis on Infinite Earths drove many back to reading their comics. Character creation could still be a huge pain, but DC Heroes seemed to have faster combat. Eventually the rapid change-over of editions killed off the game for us. Mayfair focused heavily on modules over sourcebooks, which left many purchasers out in the cold. Champions, on the other hand, remained and expanded. 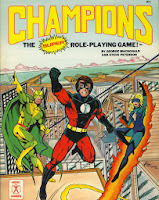 What really put the stake in the heart of other superhero rpgs around here was Champions 4th Edition. It did everything right. With a bright cover by legendary comic artist George Perez and a new complete approach, it brought in new players and reinvigorated old ones. They fixed problems, retooled elements but mostly kept things intact. Creating a distinct line for HERO system also encourage new people to try out the engine. Where GURPS had led they followed. It helped that Champions 4e also had some excellent supporting material, including Ninja HERO and Dark Champions, both of which spawned multiple campaigns in our area. Champions 4e remains my version of the game. It helps that my late friend Barry helped illustrate it. His drawing of a typical gaming group arguing includes me. You also can’t underestimate the importance of the Heromaker software in pushing the game forward. 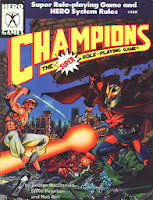 Champions 4e came out in 1989, and it did well. In 1993 Heromaker appeared and everyone I knew who played and had a computer bought and used it. Eventually they released a deluxe version bundled together with the core book. Heromaker offered the first truly useful piece of software for gaming. There had been DM assistant programs before, but nothing with this utility. Champions character creation involved math, look-ups, and moving calculations. Heromaker streamlined all of that. It showed what computers could offer at the table- assisting with the most mechanically heavy portion of the game. 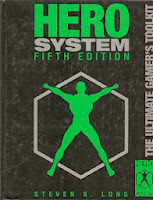 Hero System broadly, and Champions in particular, powered many campaigns I ran, played in, or heard about in our area. It competed with GURPS for dominance in our groups. At the same time, I saw less and less talk about that among new players. Superhero games, strangely, took a hit in the 1990s in our neck of the woods, despite the boom cycle in comic books. New players moved to AD&D, White Wolf, Deadlands, or Rifts. Gamers with more eclectic tastes went to On the Edge or Ars Magica. You ended up with old blood clinging to the system and new players ignoring it. Despite fantasy, supers, SWAT, and other games happening in it, Champions lost ground. The d20 explosion only accelerated that process. In 2002, Hero Games released HERO 5. Even those of us who enjoyed the system didn’t pick it up. We’d been happy with 4e. But the edition switch isn’t what pushed me out of Champions. For years we’d joked about how long combats took. When I ran, I wouldn’t start a fight past a certain time because I knew we wouldn’t be done with it for at least two hours, if not longer. As well, I just wasn’t as good at Champions as my players. I never managed to develop the expertise they had in character creation, managing maneuvers, and playing the board. They always wiped the table with balanced adversaries I created. When I crafted overpowered villains, they’d still destroy them, but then spend the last part of the session complaining about how unfair the fight had been. Over time I’d gained mastery of other systems, but Champions always smacked me around. Still it did super-powers so well that I stuck with it. The straw for me came in trying to teach the game to a completely new group of people. They’d played other rpgs, but Champions absolutely left them cold. They had played other faster, easier, and less convoluted systems. Even my wife, a database admin and former math teacher became stumped at the table. Yes, we could have learned the game and perhaps in time it would have felt natural, but it would have been a slog. Why should I do that when other, better options exist? Games with fun combat, faster resolution, and easier character creation. 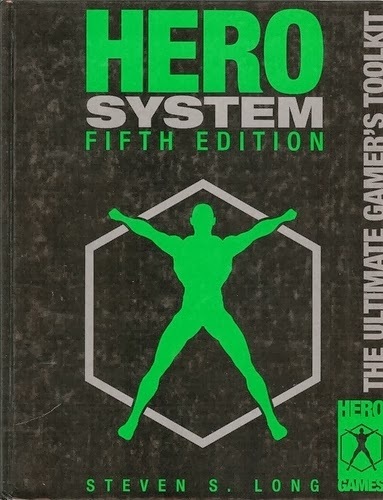 HERO system and Champions changed and influenced gaming. I think that gets lost when people dismiss it as a math exercise. It offered a new and systematized approach to character creation. Melee and Wizard might have had the first point-buy mechanics, but Champions took that in a completely new direction. It broke down the building blocks and gave players and GMs a construction set, the Legos of gaming. 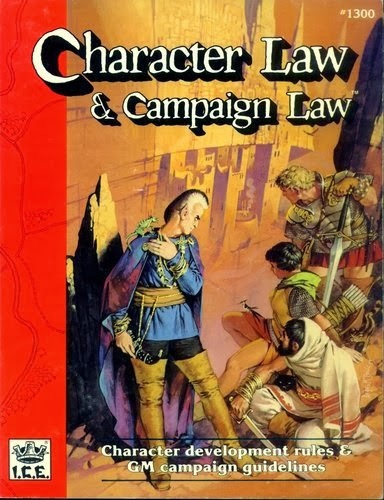 Many, many of my favorite moments in gaming come from HERO system campaigns. But most of that comes from general play- not from combats, not from character creation, and not from session prep. Yet we still have several players in our group with an abiding love for the game. It is a great game, but not a great one for me. I remember playing Monopoly, Clue, and Life growing up and enjoying them. Until I stopped enjoying them. I played Star Fleet Battles through expansions and editions until I realized I didn’t want to any more. I played Micro-Armor, Napoleonics, and Warhammer 40K but I don’t anymore. And in each of those cases, I don’t have any real feeling of nostalgia- no desire to go back and play it again. It isn’t so much about new games grabbing my attention, but what I got out of those games being less important now. With RPGs, my feeling’s a little different. I can’t think of any rpg I played in the past that I wouldn’t go back and try again- if someone I knew was pushing it. I might do so reluctantly, more in some cases than others. But I don’t have the sense of “Nope, not again” that other games give. But many things would have to line up to get me to the table for some. I have three game systems I played for years- multiple campaigns, characters, groups, and stories. Then I put them aside. For many people I know D&D would be on this list. But D&D never held on as a solid option. I started with it- learning from the tan box and then moving on to the Holmes box and then AD&D. But I didn’t play anything long term- pick-up games and some modules. I don’t recall ever having a character last for more than a level or two. In high school I ran AD&D briefly, but eventually dropped it in favor of other games and systems. The last time we went back to play it long-term ended up a tongue-in-cheek parody game that lasted for several months. In our area, a split happened pretty early. We had a faction of older gamers who’d come out of the wargames tradition to D&D. They saw it as a strategic game of the GM trying to kill the players. We also had a younger gaggle of players who pretty much bought TSR games. But we also had my sister’s age range- a large cohort who tried new games of all kinds and set some of the tastes for the area. That produced a focus on V&V (and then Champions), Call of Cthulhu, and oddly Rolemaster. RM became the go-to fantasy system for people wanting to do more. Still young, I had the chance to sit in and watch a couple of RM sessions run by a GM named Matt Myers. He blew me away with the level of detail, both in world building and rules. I wanted to be that kind of GM- spinning a world that players talked about after the game, with an encyclopedic knowledge of the setting I’d created. I was in Middle School, so sitting in on a game run by these older players (seniors and college age!) had a huge impact. Not long after I watched those sessions, I actually got to try out Rolemaster. As a system it had some problems. Early on it had presented itself as a set of options to bolt on to other FRPGs. Spell Law, Campaign Law, and Arms Law came out of the early tradition of third party products trying to expand and offer new options. In some cases, they offered new games which looked like old games (Arduin). In others, they presented generic options which could be tacked on…maybe (The Compleat Alchemist). Rolemaster straddled that line. It stood out in presentation with everything printed on parchment-style paper and some books on heavy cardstock. When I actually first played RM I didn’t like it. At first level I had one spell- "Boil Water," which couldn’t be used to actually hurt anyone. However in high school the first seeds of the steady group I’d play with for the next decade began to form. We had a mix of players my age and four years older. One GM, Paul Dunivent, made Rolemaster his own. He bought up everything for it- the Vog Mur and Iron Wind modules as well as the newly released Rolemaster Companion. Iron Crown had just redone RM in a more accessible approach- not the later red cover edition, but a reprinting and reorganization that made the game feel complete. Bizarrely, Paul combined the high-power gameplay of Rolemaster with the low-fantasy setting of Harn. Somehow it worked- particularly because Paul mostly used it for place names rather than themes. We played a lot Rolemaster, exploiting loopholes in the system and trying to interpret the rules as best we could. A couple of times I played it at conventions only to discover very different interpretations of the mechanics. 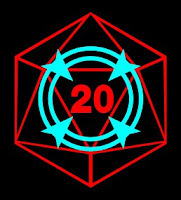 Our campaigns for the next several years broke into one of four groups- Rolemaster, Superhero, GURPS, and other weirdness (including AD&D nostalgia). We played every Friday and Saturday night on a weekly basis. All through high school and college, Rolemaster became more and more complicated. Well, not complicated- because you could really make it as complex as you wanted. Instead ICE kept putting out new options and supplements. We bought all of the Rolemaster Companions, of course. 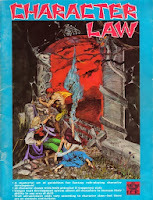 But we also bought the Creatures and Treasures books, War Law, Sea Law, Shadow World, the Alchemy Companion, the Arms Companion, Spell Users Companion, and eventually the power-gamer crazy-assed supplement the Elemental Companion. I ran and played that flavor up through the late 1990’s You had to pick and choose your poison from the system- which classes actually fit, which spell lists didn’t break the game, which skills of the hundreds would actually get used. We had a good time with it over many campaigns. 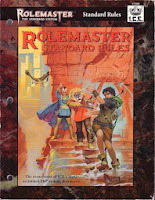 Then we switched over to Rolemaster Standard System, a retooling of the basic engine (also called RM 3e). It consolidated the rules, cleaned up the skill system, and tried to make it feel like a coherent and complete system. It still had optional bits- but the supplements offered more bolt-ons than new approaches to the rules. The switch ended up being fairly painless- except for the price of buying new books. I ran a complete multi-year campaign using it, as well as a reskin to handle Legend of the Five Rings. A couple of other people ran campaigns as well. However the change to something less slap-dash cost Rolemaster something. Before it had been f*cking insane. I mean seriously crazy with all of the bits, bobs, dials. Look at all of the stuff going on in the Rolemaster Companions I-VII plus the others and try to stitch that together. Even basic concepts- like initiative-- could have several parallel complicated and arcane rules versions. And part of the charm of the game lay in that weirdness. When they clean it up it lose some of that magic. But more importantly, it felt like too much work for what you got out of it. Character creation and advancement became a bear. The power curve as you advanced become silly. Plus I lost some of my appetite for a combat heavy fantasy campaign. 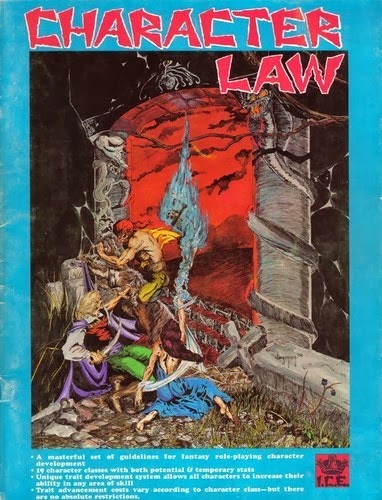 I wanted more of a balance- between the low-power fantasy I got in running GURPS 3e (the other big fantasy system I used) and this old-school power game. In the end, I packed up all of my RM stuff and handed them off to another player. They had fond memories of the games and tried it, but eventually ditched in favor of 3.5 and then Pathfinder. Rolemaster hugely influenced my gaming- showing me lots of options and forcing me to really gain system mastery in order to make the game hum. But I don’t think I’ll ever run it again. At times I have nostalgia and consider what it might be like to run from just Character Law, Spell Law, and Arms Law, but I think better of it. I have other game systems I’d requiring less effort to push uphill. These that’s that really important to me: I don’t want to fight with the game system I’m running. First in a series on games I loved, but no longer play. 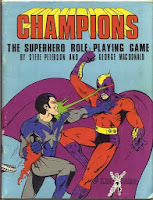 You can find Part Two: Champions here and Part Three: GURPS here. 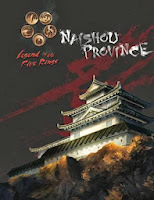 I haven’t written much about my current L5R campaign, but it continues on quite well. I’ve found a few rules tweaks I need to make to the homebrew system but nothing has broken. The players are members of a new family of the Dragon clan, occupying lands formerly of the Lion. The campaign’s set in the Clan War era, following a version of the Scorpion Clan Coup which didn’t exile them (long story). The group built their family in a collaborative session you can read about here. I’ve also written about how this Clan-based campaign works (and how it borrows liberally from John Wick’s excellent Blood & Honor). The campaign takes place over the course of years with players investing in and developing their region. Each season we do a few sessions of adventures and then transition to the next. In between seasons players make choices. I’ll talk more about those picks in another post. Today I want to talk about how I’ve used those break moments as an opportunity to develop history and get story inspiration. To add variety I developed a system to add events for each season transition. I began by putting together a list of random events- abstract phrases and descriptions more than anything specific. I own several games (Red Tide, Birthright) with random nation event tables. At first I lifted just from those, resulting in about 200 different items. Then I realized that the Legend of the Five Rings CCG has a massive range of descriptive phrases I could borrow from Event and Action cards. It too some time, but I pulled names from an online card manifest. Then I had to go through to weed out duplicates, change overly specific references, and cull odd ones. I ended up with a list of 1000 random events. Some would be pretty easy to figure out: A Plague Spreads, Bountiful Harvest, Bandit Raids. But most of them would require some serious interpretation. Some examples: A Matter of Honor, I Know That Trick, Living Death. My reading depend on where the event happens. I decided that each season I would make three sets of three event pulls. The first would be “national” events affecting the Clans or the Imperial House. The second would be “neighbors” affecting the families of the clans directing bordering the players’ province. Last would be the province itself which I broke down into ten areas (N, S, E, W, Center, Main City, Significant Site, Retainer Families, Borderlands, Rumors). These are on random tables. For example in the first season I came up with the following results for the transition from Spring to Summer. Phoenix: Last Line of Defense: Over the years, Shugenja have requested the restoration of the office of the Jade Champion. The Phoenix have always blocked that. Oddly they have recently established a new office within their clan with a mandate much like that of the jade Champion, under the auspice of the Elemental Council. Asako Togama has taken up the role. Unicorn: Lean Times: Word has begun to leak out that a series of accidents destroyed a good deal of the Unicorn food stores. Combined with the drop in general production from the heartland (GM’s note- as a result of the war which saw the PC’s family taking over certain Lion regions) the Unicorn have been hard pressed. GM Note: This event has had some direct impact on the game, as the Unicorn represent an important potential ally. The group decided they would quietly work to make sure that Unicorn smuggling would be given more room. The Magistrate PC spoke with the Unicorn trade representative about the matter- gaining some obligations from the clan. That an excellent move that the group came up with quite quickly. Dragon: Treachery Exposed: Mirumoto Daini declared Mirumoto Harutane as traitor to the Dragon. He and his two sons have been asked to commit seppuku for their treason. He and his eldest complied, but his youngest son, Mirumoto Mishikado fled with his wife (formerly of the Agasha). Harutane is said to have been carrying on treasonous negotiations with the Unicorn, though what exactly happened remains uncertain outside the Clan Champion’s council. Lion: Matsu: Destined Enemies: Matsu Tsuko, Clan Champion and daimyo, clashed with Akodo Kage over leadership within the Lion. This has forced many within the family to take sides. Lion: Matsu: Light of the Sun Goddess: A minor shrine to the Sun Goddess experienced a visitation from Ameratsu. She appeared and placed a wakizashi within the shrine which gleams like the sun. The Matsu and Kitsu are currently discussing the nature of the visitation. GM Note: I’ve developed this further with the Emperor intervening and declaring that the Matsu must hold a tournament in order to gift the weapon to a worthy champion. I’m not sure if I’ll be able to maneuver the PCs there- but I have a couple of ideas about that. Unicorn: XXXXX XXXXX: Skirmishes continue in the lands between the Scorpion and Unicorn. Infiltrators from both sides continue to fight the war, despite the Imperial edict against open conflict. Rumor has it that the Moto found and raided a significant Scorpion site. GM Note: I don’t want to say what the event was- as some of my players read this, but there’s a secret hidden there. Borderlands: Glimpse of the Unicorn: The north has seen a flurry of Unicorn activity- smugglers, infiltrators, and the like. GM Note: I tied this into the earlier national event, suggesting that this came from desperation on the part of the clan. Rumors: Malevolent Creed: Stories have reached the main city of Maru Katei of strange travelling monks within the province. They seem to be agitators, speaking quietly and subtly against the Celestial Order. Some suggest they spread a strangely twisted version of the Tao. Exactly who and what they are remains uncertain. Central Region: Demagogue: Abbot Matahei, senior monk of the Monastery at Rekiju has been in at Maru Katei visting the shrines and sites related to his order. His monastery, the most important in the province, is dedicated to Fortunism. (GM Note: The players selected a monastery as one of their provincial resources). Rekiju has two major sites dedicated to Bishamon and Sudako. Matahei has been speaking about the importance of the fortunes in the province. In this he has been quietly suggesting that the common folk avoid adopting the more kami and Taoist tendencies of their new Dragon overlords. While he hasn’t made any direct comment on the new daimyo, he could become an irritant. GM Note: This ended up inspiring a set of episode for the current season. The group has tried to track these strange monks with no great success. More importantly, they opted not to confront Abbot Matahei directly. Instead while nearby, they paid a call on Rekiju and made a positive impression, albeit one laced with the implication that the monks needed to fall into line. They backed that up by uncovering a Bloodspeaker conspiracy to burn the monastery down and increase tensions in the area. We’ve only had one seasonal transition so far, but the next is coming up fairly soon. I’m usually not a big one for random tables, but I’m pleased with this. It has given me a number of ideas about plots and events for the campaign. In a superhero campaign, I usually offer “news” briefings with lots of plot possibilities the group can pick through. This has a similar function. It also offers a sense of the broader world as a whole. There’s a freedom for me in letting these events determine Rokugan’s current path. Thanks to everyone who participated and came up with awesome (and often awful) NPC details. I'll put together a post of all those ideas next week. Update: I have not heard from the winner with 48 hours of announcing. I tried to contact the winner via G+, with no result. Per the rules I set in the contest, I will be generating another result and a new winner. The new winner is: Paul Mitchener. Paul, if you could contact me with a mailing address, I can send that out to you this week. I posted my FATE reframe of Changeling the Lost, but I’ve been considering other approaches to the setting. CtL hits the kinds of stories I enjoy- mixing of sympathetic character stories and discovery of the strangeness of the world. The personal drama of the setting and the suggestion of PTSD click for me. DramaSystem offers a set of rules to emulate dramas, with HBO series like Boardwalk Empire, The Wire, and The Sopranos as the model. You can use DS to reframe and refocus existing games, especially those with more rp than combat, more interactions than procedural notes- like Changeling the Lost. We’ve seen a number of Changeling-like shows in the last few years- Once, Grimm, and Lost Girl. While I wouldn't use this as the basis of my current campaign switch-over, I can easily see running a DS/CtL campaign. You have a group of people put together by circumstances, “political” interactions with other groups, secrets, built-in personal dichotomies, and a looming threat (the Keepers). Here’s how I would structure a pitch for that. Stolen away from the real world, the characters have survived years of magick, manipulation and torture at the hands of the Keepers. A mysterious figure rescues them from the Hedge, dropping them in the city of Wayward. There these strangers discover the hidden Hollow and a pledge requiring them to restore it. They discover it once belonged to the Court of _______ which mysteriously vanished years before. The players must find a way to work together and recreate the Court to bring balance to the city. To do so they must contend with the agendas of the remaining three Courts, the weirdness of the city, the machinations of the Keepers, and their own nightmares. Obviously this campaign frame works best with a group which knows the Changeling the Lost backstory and set up. It might make a useful second campaign. This structure hand waves a good deal of the magic, such as the Contracts and Kith abilities. It assumes the players can negotiate the extent of those abilities (with the GM as judge). Interestingly, petitions can become concrete in the form of pledges. Players may struggle with those choices- especially when they have not only personal but magical consequences. I love the idea of a secret pledge creating an extra dimension of pressure in a scene. An obvious dramatic pole arises from the tension between a character’s instincts from their Seeming and their humanity. An Ogre’s gullibility and their drive to use physical force balanced against stubbornness and desire for peace. More generally desire for acceptance in changeling society vs. human society can motivate the characters. You can have the players develop the city through play (as happens in Hillfolk and similar DramaSystem pitches). Alternately, you may wish to have the players build the city before or after character creation. You could use the urban-variation on Microscope, with factions representing power groups in the city. Alternately, The Dresden Files gives a great framework for collaboratively creating a city and deciding what stories interest the players. Choosing the Court’s also important. Each has its own tenor and feel. If the players will be rebuilding the Winter Court, that makes for a quite different game than if they must found a new Summer Court. That also affects their primary rivals. I especially like the idea of the players collectively coming up with a new spin on the themes of a Court. (My earlier post on Courtly Campaigns may be useful). A good deal of the starting work will focus on the internal life of the Court as players test out those relationships. I think generally the other Courts should be a more distant and looming threat. They’re wary of the upstarts, but can’t really critique the concept of returning balance to the Freehold. Eventually one or more of these Courts may become important, especially based on player interests and choices (villains or allies). So what kinds of NPCs might the PCs play around with early on? Most obviously people from their past lives, depending on when each character vanished. I’d encourage each player to have at least one friend, relative, lover, or enemy from their past life as a possible source of interactions. Fetches offer another flip side to that. As a GM you should decide if the players will choose their Fetch’s nature or if you will. I prefer the latter as it introduces some interesting tension and mystery. “Free” changelings offer the other major early bloc of characters. These aren’t affiliated with any of the Courts for various reasons: enemies made, see as unworthy, actually a spy, etc. Some might seek out the new Court looking for aid, some for someone to ally with, others with more nefarious reasons. Eventually the PCs will assemble a community out of these changelings. The starting point's a tougher question. I think you have two basic choices. On the one hand, you could suggest that all of the characters had the same Keeper, but ended up with different Seemings. Perhaps they were all traded to or stolen by another Keeper. That would allow the players to build some relationships before their escape from the Hedge. Perhaps they forged those bonds in the process of escaping? On the other hand you could start the game with the Changelings in the real world, with those ties established. They arrived a little while ago (perhaps a few weeks) and have made those connections. Early scenes could be called to explore the players past- i.e. a focus on flashbacks and revelations. As I mentioned above, we have several recent TV series which offer inspiration. Lost Girl’s probably the one which feels like someone actually played Changeling. Grimm and Once both lift from Bill Willingham’s Fables series. That’s another great resource. The 4400, at least early on, deals with the question of people out of time and returning to a world which has passed them by. Most modern urban fantasy has something to offer, including books like Grossman’s The Magicians. Serial novels usually have more procedural elements to them, but they can easily be borrowed from. 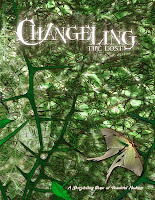 In the end the best possible resource is the Changeling the Lost material itself. There’s a pleasure to reading those books and ignoring all of the mechanical stuff. Obviously any kind of kith and seeming could work in this setting. Having a diversity of types will make the game stronger. They also offer some archetypes which everyone can work with and play against. I don’t think I need to offer a list, just flip through the CtL core book- and the Lord of Summer supplement which focuses on the Courts. Having the group build or even just sketch what they want in the city setting gives the richest approach. The city should be big enough to have lots of interesting places, but not so huge that we don’t have a sense of place. Notice how these shows with a static city usually end up returning to key places. The city feels small and we usually cut out travelling times unless they’re used to showcase a conversation. More importantly consider what the players Hollow looks like. How big is it? Does it have secrets? Perhaps it is in an abandoned museum, hospital, or university. Why did it close down? A mysterious mansion works as well, perhaps with a parallel and reversed mansion in the Hedge. It should be spacious enough that NPCs can arrive and stay. You want to be able to call multiple scenes in different locations over time. Who will be the Prince? Oddball magical incidents and strange events can easily be used to prompt incidents. GMs have access to a variety of magical McGuffins. One of the Other Courts Takes Umbrage at the PC’s Efforts. A dangerous mortal learns their secrets. Another kind of supernatural threatens them. 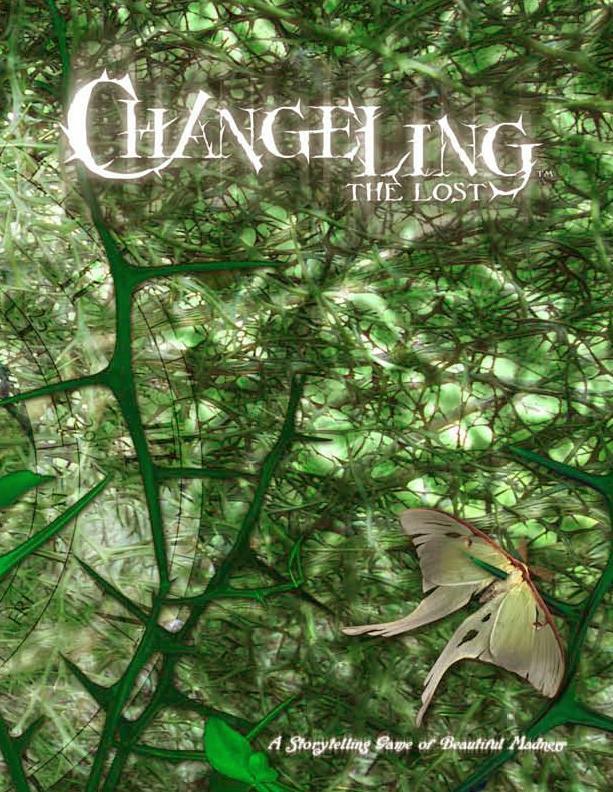 This week I wanted to put together some pieces on Changeling the Lost, my favorite of the nWoD settings and possibly my favorite game from WW. In 2008, I took a look at CtL and wanted to run it. But I didn’t want to learn nWoD- I wanted a system I knew for the f2f game. So I worked on a conversion to our Action Cards system. I did a fairly literal hack- making sure I had all the details from character creation. I converted all of the contracts- probably the part which took the longest. The campaign went well, except for a couple of player hiccups. But the system worked in part because the longer we went along, the more I hand-waved concepts. I also ended up wasting a lot of time and energy putting that hack together- trying to keep everything from the original. Last year I decided I wanted to try to run some more online. I’d developed some ideas I wanted to try in a new campaign context. Running online meant playing with new people and trying to establish an easy baseline. Since most of the players knew it, I opted to run this campaign using nWoD- as much as anything to see what people actually got out of the full system. I believe GMs should stretch themselves from time to time- running systems they might not ordinarily try out. So I’ve run 20+ sessions of nWoD…well, not exactly. I’ve probably really actually run “Baby’s First” version of the game. I have to admit that. The system has a high rules density, but at the table I play it pretty loose with mostly the basic rules. Those work decently, primarily because I ignore the chrome like lots of modifiers. My problem with the game is the rule density. Everything feels like a strait-jacket. You have wonderful ideas and concepts, but then tons of mechanics and systems to handle those. So you’re left with a couple of options. Either ignore and streamline those, as I’ve normally done or else play with a highly granulated and IMHO highly restrictive set of rules requiring significant referencing. For the last twenty years, I’ve been running increasingly easier and more streamlined game systems. That’s not to say I haven’t run some crunchier things in the meantime, like D&D 3.5. But in most cases, I’ve set aside complex games I used to invest in heavily: Champions, Rolemaster, and GURPS. In the case of the last two, I’d been cutting out rules and sub-systems for those games- focusing primarily on the core resolution system and trying to make the rest of the game flexible. A chunk of the campaigns I’ve run have been our homebrew rule-lite system Action Cards which is probably closest to FATE at this point. But I also ran a good deal of Storyteller- Vampire, Exalted, and hacks for L5R and Wushu. I don’t think nWoD’s is necessarily a bad game- it works for aspects of the game that I’m less interested in. I like the core resolution mechanic: skill plus stat to form a dice pool is decent. But the problem lies in how that becomes elaborated in books beyond the core. When I ran ST from the book I worked to become proficient and fast at resolving combat and skills. For chrome elements, I concentrated on cool things the bad guys could do in the system. But the complicated parts- magic, powers, charms, talents, whatever- I left in the hands of the players. I let them use, declare, and explain how these details worked at the table. That reduced the rules competency I needed. I still made rules calls based on logic, primarily based on GMing experience, rather than an encyclopedic knowledge of the game. But I have an opportunity right now with the online game. We just had a couple of players bag out, but the remaining ones would like to continue to play. We have one previous player who I hope will also be returning, and I may hunt down a couple more to round out the table. One of the remaining players is getting married this month so we have a couple of weeks we’re going to skip. That gives me plenty of time and a good break to consider switching the campaign over to another system. The most likely candidate for the switch would be FATE. So how would I do things today if I wanted to convert Changeling to another system? Obviously I’d want something simple, where powers and such can be easily described. For the moment the easiest option would be FATE. This time I’d avoid going down the route of writing up all of the Contracts and Kiths. The problem with sticking to those lists and options is t I’d keep two things in mind based on my past experience. First, don’t worry or even bother to translate everything. Too often in the past I’ve wasted effort on full rewrites. These either hogtie my options or simply don’t get used (see my work on Scion, L5R, and my earlier CtL hack). Second, include those mechanics I enjoy even if break some of the symmetry of the system. If it’s going to be a set of house rules, then make it rules for my house. Aspects: Players would begin with the standard four aspects. One of these would relate to either their kith or seeming. One would be their trouble aspect- essentially built on their character’s Virtue/Vice, whichever seemed more important to them. The other two would be more open ended. If we’re converting from an existing campaign, then I’d ask the players to build one of the aspects based on campaign events. The other they’d be free to choose. If we’re starting fresh, then it depends on the set up. If we’re playing fresh-from-the-Hedge changelings, then the standard Fate collaborative set up might not work as well. Perhaps I’d figure out a way to tie that into the world-building process. Skills: For this conversion, I’m building on Fate Core, rather than FAE. The latter is excellent and could also be used. I’d likely go through and pretty closely convert the Changeling the Lost skill list over. A few I’d drop, to get to an ideal number closer to two dozen. Where possible, I’d link those to the Fate core list. Those offer simple and tight options, plus there’s the advantage of having the Stunt list already. A bigger question would be whether I’d use the Skill pyramid. That often stumps players when I explain the game. If we’re converting over, then I drop that concept. If we’re starting new, then I’d use it. Contracts: The “powers” of the game, these make the game mechanically distinct. In the past, I spent time working through all of them. Screw that. Even writing up the contracts lightly, you still end up with a particular read on them and a more limited sense of what they do. As I mentioned above, there’s a break that moment when you tell me my Contract can animate objects and then you read me the full page of rules text limiting that. Instead, we’ll make up a list of the existing contract sets and a one sentence description of what they do. When players buy a contract, they get to decide how they want it to function. Each contract can be an Aspect, a Stunt, or a Gift. At any time during a scene, changelings may decide they wish to begin using contracts- if they do so they spend a drama point as an overall initial tax. After that, they may use any and all of their contracts once for free for the scene. If they wish to use one a second time, they must either spend a drama point or make use of a catch. Contract Aspects are used just like any other aspects. They’re open ended, but require some thinking. For example "Display of Grandoise Might" could be used in several different situations. Contract Stunts function just like regular Stunts from the Fate rules: a new action, a bonus to an action, or a rules exception. Generally these represent concepts like heightened strength or dexterity for a scene (general +1 bonus to a skill) or enhanced talent with a narrow use (like machine crafting gaining a +2). Contract Gifts just allow you to do a thing. You can glide. You can peer into a dream. You can talk to animals. You can make an animated machine that runs on its own. You can hold an object in place. The GM might require a roll depending on what you’re doing. Contracts would be generally purchasable- with some restrictions. I’d have to figure out how to handle that. Perhaps they’d need a learning experience to buy a new one or have to do something in game. This approach has several advantages. First, I don’t have to write everything up. Second, two players could have the same contracts but define them slightly differently. Third, it would be dead easy to make up new contracts. Fourth, it brings back surprise and uncertainty to the game. Players couldn’t be sure what powers other Changelings possessed. Limitations to this? Obviously it requires the GM to monitor the players’ suggestions. The GM would also want to price things such that the PCs don’t simply invest in contracts to the exclusion of all else. A simple restriction like the concept that multiple aspects have to come from different areas could balance this as well. Standard Stunts: Players could also purchase regular stunts if they wanted, with the normal costs and restrictions. Glamour: Drama points are effectively glamour. Changelings have a slightly larger pool of drama points than your average person. Regaining drama points could also be done through glamour harvesting, as per the CtL rules. Higher Wyrd characters have a larger pool of drama points. Stress: Changelings would have three stress tracks: Clarity, Social, and Physical. Clarity covers all mental damage: fear, rage, alienation, and so on. All of the classic nWoD business about phobias and such would be handled with consequences. Social stress would simply be about rank within Changeling society. Manipulations and trials could be more easily be played out. Social consequences might involve making promises, being forced into bargains, or getting the short end of a pledge. Social damage might heal quickly, unless the opponent chooses to permanently reduce the victim’s rank. For the Physical damage track, I’m of two minds. On the one hand, I appreciate the simplicity of the Fate one roll determines hit and damage system. On the other, I like rolling damage (as I mentioned before). I know it seems weird to add granularity here, but I might try to figure out a method for rolled damage and increase the number of boxes on this stress track. Everything Else: So what would I need to work out? I’d probably have to figure out how Pledge function if players want to use those. Some elements- like the Hollow and such I’d handle as a collective property for the group, with stress tracks which could be drawn on. If I do a diced combat system, I’d have to work out weapons and armor. So that’s my first thoughts on that- I have to check with the group and see what they think. We could do a Fate conversion, stick with nWoD, or look at something else (like Action Cards). If we choose a conversion, I want something simple and easy to develop. I want the players to have the chance to define their characters they have in their heads, rather than trying to wrestle that concept into the rules. After a short Gen Con inspired break, the Play on Target podcast returns this week with a pretty practical topic: how to better engage players. While we begin with some general discussions about what engagement looks like, we slide into specific suggestions and techniques. I'm happy with how this one turned out- with a number of ideas that I'll be stealing for my games. As always I have a few additional thoughts about the topic I've put together here. 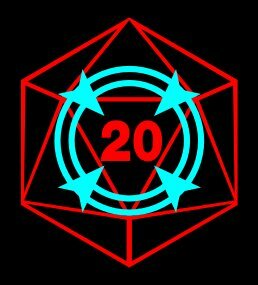 I run a lot and I'm a confident GM, but even so I often find myself falling into cycles worrying about how hooked the players are to the game I'm presenting. We skirt an important dimension in our discussion: that different people have different kinds of investments in games. Some players really enjoy being active at the table, demonstrating excitement, and working on play details between sessions. Some players don’t. The two may be equally enjoying themselves, but to the GM one appears to be passive and unengaged. I see this question pop up fairly regularly on forums: what do I do with a player who comes, doesn’t rock the boat, but doesn’t seem to do much unless prodded? I’m not sure I have a great answer for that- especially if it is truly a case of that player enjoying themselves. And where the players “passive” play doesn’t negatively impact the rest of the group. Ideally, we’d like to have a table of fully active and engaged players- so that passivity feels like a problem to the GM. I don’t think it necessarily is one. It does mean the GM has to take a few extra steps. First, recognize and accept that the player’s having a good time- check with them, ask if there’s something they want. Second, make sure that you don’t overcompensate with the player. I’ve seen GMs throw themselves into contortions, trying to hook and entertain quieter players. That can lead to ignoring more self-motivated gamers at the table. Putting crucial or key plots in the hands of those players creates more problems than it solves. They’ll let those drop and the rest of the table can become frustrated. Third, don’t ignore these players. Prepare for them. They will react to things, but they often won’t be proactive. Craft some set-pieces and oddball incidents to throw at them when it is their turn in the spotlight. Give them something they can work through- like having their pocket picked, spotting an unusual character, or the like. If you have a list ready, you can throw that at them when they shrug their shoulders. Perhaps something may stick and you might find a detail that does hook them- and you get to make something bigger out of a throwaway. 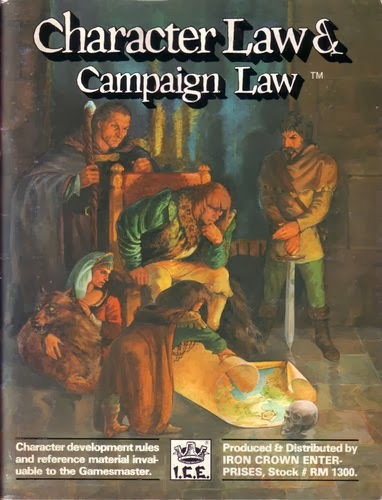 I’ve only run two campaigns online so far (a total of about 50 sessions), so I still consider myself a novice on that score. I think the online environment offers new challenges to engagement. There’s a huge difference in the mental space of going to someone’s house or having people over to play and sitting down at the computer. I suspect it’s easier to bail out and skip a session with the latter. That may be a better thing- it might be easier to quit a bad game or bump a bad player. But I suspect it can be harder on GMs who’d like to have the same kind of engagement and emotional feedback they get in a f2f game. I suspect much of what we said in the podcast applies to online- but I wonder if there might be some online-specific best practices? Explicit social contracts? Shorter campaign arcs? Games aimed for player drop in and outs? That’s a topic worth doing more research on. I wonder if we might also consider GM investment. I’ve seen some discussion of this around the blogosphere recently. One GM lamented that an unequal exchange existed between the players and the GM. The latter put in tons of effort, but the players rarely if ever even began to match the GM’s effort or work. Myself, I can be disappointed with that, but I think it is the nature of the beast. I’m not sure exactly what we could expect demand from our players: more backstory or session write-ups. I think more likely we’re talking about wanting them to exhibit some system mastery, learn the rules, and keep their characters up to date. I’ve had a few players over the years who’ve never grasped the mechanics, despite many hours of play. That can be frustrating, but I’ve grown used to it. I can’t imagine being angry because players aren’t writing or doing as much as I am at the table. That feels like wasted energy. I mean, I’d like for them to do more, but that’s a matter of hope. I think the closest I come to this being an issue is the jealousy I feel when I see players heavily invested or involved in another GM’s game. I’ve played with GMs who’ve been desperate for outward and visible signs of player interest and approval. If they didn’t get enough they would often become moody and complain about the group not being interested. More often than not we’d be trying to make it clear to the GM we liked playing the game and had been having a good time. But if we weren’t sending emails and planning between sessions, they felt like we didn’t care. A few times we’d get into cycles where we had to be overly enthusiastic at the table just to make sure things kept running. It put us in a strangely co-dependent relationship, having to constantly reassure the GM for fear of him wrapping the game early. The irony to this would be that the worst offender GM finally got his wish with one amazing campaign. He had a crew of highly engaged people, all of whom sent him emails and played out sub-plots away from the table. They thought about the story and details, to the point that the GM started to feel insecure about the plot. The volume of email and interest wore burned him out and he stopped the campaign- destroying most of his credibility with the players. A couple of times he tried to restart it, but he’d already broken the group’s trust. That’s more of a question of a depressive personality, but I’ve seen GM disengagement just as bad as some exhibited by players. We used to have a GM in our group who would come up with really great concepts for campaigns- and we’d get rolling on them. Then several sessions in, after we’d be hooked, he start to talk about another campaign he wanted to run or began to grumble about the present game not being exactly what he wanted. Then sessions would get cancelled or tweak would occur, leading to the game just kind of petering out. He rarely overtly ended a campaign, instead he’d just stop caring and let it die. An artist, with an artistic temperament, the next cool thing always caught his attention. It became a running joke for the group, but we still went back to play. A few times we tried to talk to him about the problem but he always acted as if this came as a complete surprise to him. Sometimes he’d say a game was just on “hiatus.” I can’t fault him too much- I recall starting and dropping campaigns in my early days, but I always felt hugely guilty for doing that. Keep in mind, players can’t engage with a game unless they have something to engage with. If you want them to play around in your sandbox, put some toys in there. I remember a Cyberpunk campaign we played in with a really linear, mission-driven focus. Then, when the GM wasn’t prepped he’d go: what do you want to do? But we’d seen almost nothing of the world, had no other hooks, and he’d literally killed off or put in a coma every person we’d met. The blank slate offered nothing to engage with. On the other side, remember that too many choices and details can overwhelm the players. You might think you’re giving the players a cornucopia of plots, hooks, and options- which you are- but you’re also burying them. They have to dig out from under that- trying to figure out what’s important to you, the GM. Even if you say everything’s fair game, the players instinctually try to suss out where you want them to go. Sometimes so they can go there, and sometimes so they can avoid it. Jim Jacobson, in Blood on the Snow, raises an interesting point, “Sheena Iyengar’s famous “jam study”—in which supermarket customers presented with twenty-four kinds of jam to taste were more enthusiastic, but ultimately chose to buy jam less frequently than those who were presented with only six kinds of jam—presents a situation very much like the choice of a (DramaSystem) series pitch.” I think the same can hold true for dense games- where the GM tries to go for engagement through info dump. 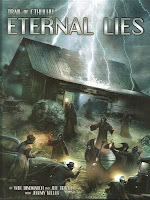 I’ve been working my way through Eternal Lies, the massive Trail of Cthulhu campaign just released. 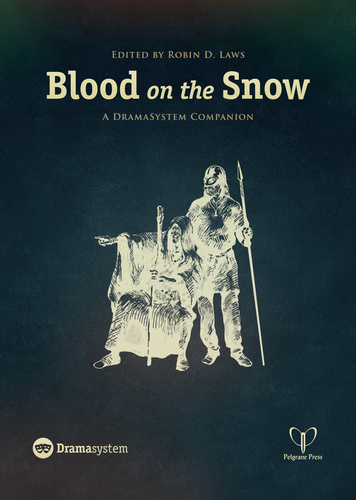 Pelgrane continues to craft a smart series of larger supplements for the game from the improv campaign of The Armitage Files, to the brilliant framework of Bookhounds of London, to the genre emulation of Shadows Over Filmland, and beyond. 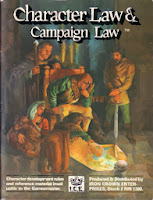 Great games often come to be defined by great campaigns and modules. CoC brought us Masks of Nylarlethotep and Walker in the Wastes for example. Just on a first pass-through, I think Eternal Lies deserves to be ranked up there. Pelgrane Press has generously offered a free copy of this 400 page hardcover as a give-away. Accordingly I've come up with a little contest. My favorite bit from Eternal Lies so far are the “Three Things” NPC details authors Will Hindmarch, Jeff Tidball, and Jeremy Keller present. Like constantly touching those he speaks with; uses an economy of speech when communicating; and old-fashioned haircut. They’re great and easily accessible for the GM. So for this contest all you have to do is leave a comment on this thread, along with an NPC detail. You can also enter by posting in a similar thread you’ll find in the Pelgrane Press G+ Community. 1. You may enter up to twice: once here and once in the Pelgrane G+ Community thread. 2. You should leave an interesting and evocative NPC detail. 3. The winner will be chosen at (or a little after) noon EST on Friday September 20th. I will make consolidated a list of the entries on both threads and then use an online random number generator to pick a winner. 4. Winners will be contacted via email or the like. If I don’t hear back from the winner within 48 hours, I’ll pick another winner. 5. The winner receives a hardcover of Eternal Lies mailed to them. I think that’s all the formalities. Thanks again to Pelgrane Press for offering this up.